The Tecan Infinite M1000 Pro Multilabel Microplate Reader is versatile, modular, monochromator-based, and adaptable to the changing needs of live science research and drug discovery. Using Quad4 monochromators technology, this microplate reader gives your lab instant access and total freedom of wavelength selection from UV to NIR, with three detection modes, absorbance, fluorescence intensity, and luminescence wavelength. This microplate reader offers a staggering number of microplate formats, from 6 to 1536 well plates and the NanoQuant plate. The Tecan Infinite M1000 Pro features z-Optimization for low sample volumes, with an automated adjustment of z-focus. This dramatically improves the measurement quality in fluorescence intensity top and polarization modes by optimizing instrument set up and compensating for different parameters like low sample volume or varying well shapes. The fluorescence plate reader is extremely easy to use and take minutes to set up. The Tecan Infinite M1000 Pro has an optimal read function for cell based applications in 12 - to 96- well formats, performing multiple measurements on spatially separated spots. This feature, available in FI (fluorescence intensity) bottom reading mode, achieves maximum illumination and sensitivity across each well, for enhanced performance. Luciferase reporter mechanisms offer a dynamic measurement window, that can record emission spectra of stable luminescent signals at 1 nm resolution. The Tecan Infinite M1000 Pro Absorbance, Fluorescence and Luminenscence Microplate Reader is able to execute double orbital shaking in addition to basic linear and orbital shaking. The plate transporter moves in a figure 8 pattern and is considered a more efficient method of mixing reagents and biomolecules, as well as keeping cells in suspension. The Tecan Infinite M1000 Pro Multi Detection Microplate Reader is compatible with Tecan’s NanoQuant Plate, an innovative quartz based tool capable of measuring 16 samples simultaneously. 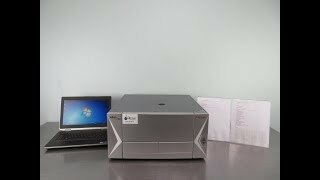 The Tecan Infinite M1000 Microplate Reader also features multi-channel absorbance, 3D scans when partnered with Magellan software, offers rapid visualization of fluorescent properties, as well as independently set bandwidths of excitation and emission, as well as AlphaScreen and AlphaLISA technology with temperature correction. The Tecan Infinite M1000 Microplate Reader features fast fluorescence polarization, and luminescence functions like attenuation of high light levels, luminescence color-filters and luminescence scans. The Tecan Infinite Pro Plate Reader is fully capable of intergration with the Tecan Freedom EVO for complete automation of assay setup, preparation and detection. We have multiple Tecan Plate Reader models in stock, click here to see our active inventory. This Tecan Infinite M1000 Pro has been tested and is excellent working condition. All of our Tecan Plate Reader models come backed with our standard right of return warranty. Each Tecan Microplate Reader comes complete with computer running control software and cables. Should you have any questions, please don't hesitate to contact us.